“I wish to apologize to the Japanese people for having betrayed their expectations,” says Yukio Hatoyama halfway through our interview, lowering his head and bowing deeply. Hatoyama, prime minister for nine months of the Democratic Party of Japan’s three years in power between 2009 and 2012, is discussing the reasons behind his resignation in June 2010 — specifically, his failure to live up to his party’s promise to block the contentious U.S. Marine Corps base construction now underway at Henoko in Okinawa. Recently, the former DPJ leader has been in the news for other mea culpas in Nanjing and Seoul — apologies made, he says, on behalf of Japanese for colonial-era crimes in Asia. These unsanctioned trips have incensed the ruling Liberal Democratic Party, which has painted Hatoyama as a charlatan and even a traitor for his foreign escapades. Hatoyama, now 68 and retired from politics, has never been able to shake that nickname. Coined by the domestic media in 2001 during his first stint as DPJ leader, the foreign press had a field day with Hatoyama’s extraterrestrial appellation, rejoicing in the fact that they finally had a Japanese leader who stood out from the crowd. But what was it that made Hatoyama appear so otherworldly? True, his saucer-like eyes did give him a vague resemblance to E.T., but his nickname was not just the product of his looks and his manner; it also owed much to his proposals — proposals that were and remain anathema to Japan’s conservative establishment. But how did Hatoyama, who came from a well-known, politically conservative family, become a maverick? In an exclusive interview with The Japan Times, Hatoyama discussed a range of issues, including Okinawa, the relationship between the Fukushima No. 1 disaster and the 2020 Tokyo Olympic Games, and his proposal for the creation of an “East Asian EU.” He began by explaining the circumstances that led him to resign the prime minister’s post in 2010 after only nine months in office. 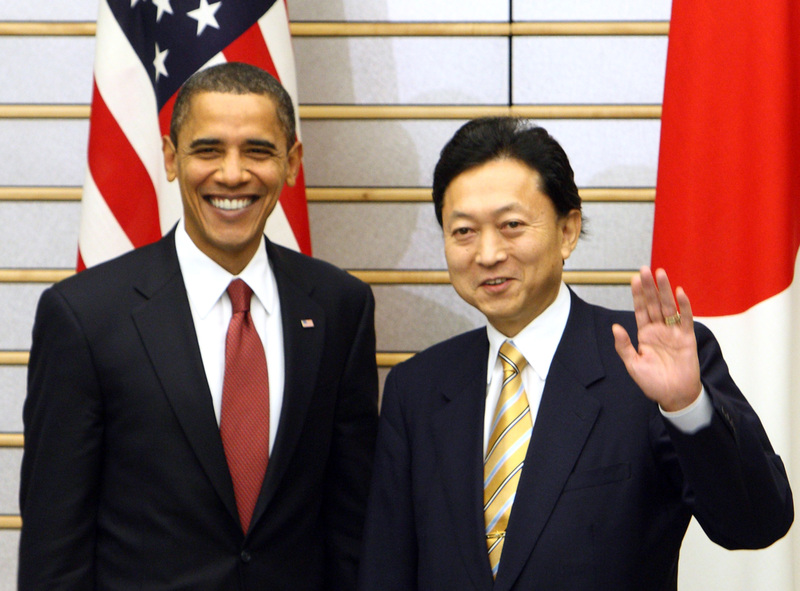 During his time in office, Hatoyama also emphasized the need for a less lopsided Japan-U.S. relationship. This was the first time in the postwar period that a Japanese prime minister had made such a demand. Hatoyama even dared suggest that Japan’s security could be achieved without a permanent U.S. troop presence. None of this was welcomed by those, on both sides of the Pacific, long accustomed to Japan’s subservience to U.S. interests. Hatoyama was born in 1947 and graduated from the University of Tokyo before going to earn a Ph.D. in industrial engineering at Stanford. Upon graduation, he initially pursued an academic career, but later decided to run for the House of Representatives in 1986. 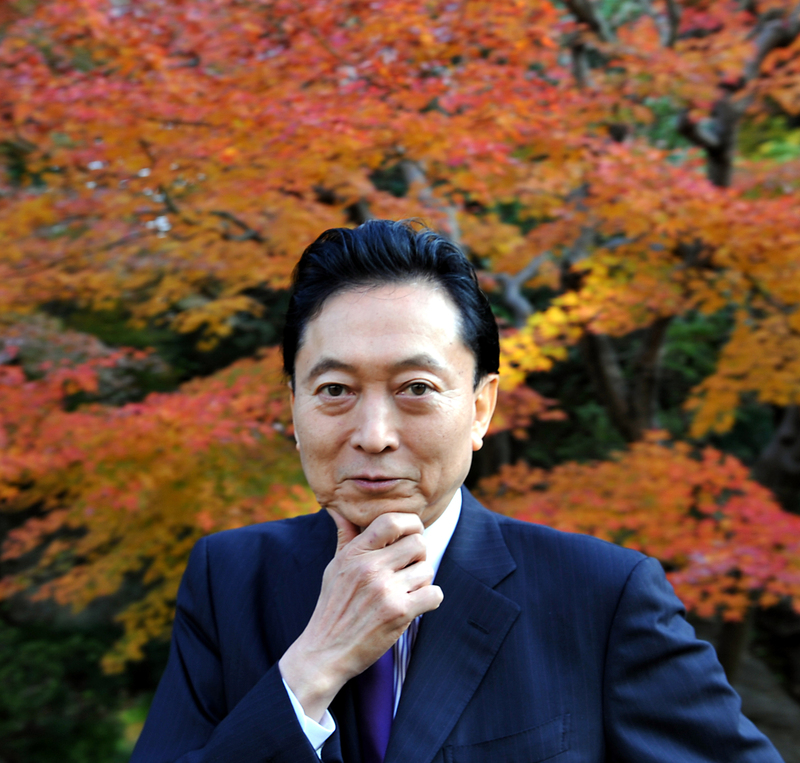 During his campaign, Hatoyama took advantage of his experience as a researcher and garnered public attention with his unique appeal for “a scientific approach to politics.” Following his election, he quickly became a controversial figure for, among other things, revealing the huge scale of political campaign funding the LDP was receiving from business interests — even though he was a member of the party at the time. A messy political realignment soon followed, eventually leading to the creation of the current iteration of the Democratic Party of Japan in 1998. Hatoyama went on to lead the party between 1999 and 2002, and again from May 2009. The DPJ grew steadily until finally, in September 2009, it succeeded in ousting the scandal-tainted LDP. 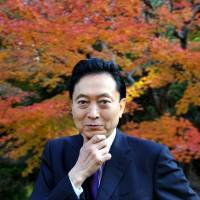 Hatoyama became Japan’s 93rd prime minister, though he would not remain so for long. Government bureaucrats, long accustomed to running the country behind the scenes, acted quickly to undermine his administration and hasten its demise. Hatoyama says that Defense Ministry officials attempted to scuttle his plan to relocate the U.S. Marine Corps’ Futenma air base outside of Okinawa by claiming that any replacement facility must be located within 65 miles (105 km) of the marines’ Northern Okinawa Training Area. “The bureaucrats and ministers who should have been doing their best to support me were in fact attempting to resolve the matter by supporting the U.S.,” Hatoyama says. The 65-mile requirement effectively precluded moving the base off the main island of Okinawa, which is a convenient 70 miles long. Yet the source of this apparent requirement remains elusive. Hatoyama says the Defense Ministry simply claimed that this figure was included in a U.S. military document. “Whether or not this requirement was expressly stated in the document remains unclear even now,” he notes. But what about the U.S.? Were American officials also involved in the attempt to derail Hatoyama’s base relocation plans? Apparently not, Hatoyama says. At this point in the interview, Hatoyama bowed and offered his apology. Another blow to the fledgling DPJ administration came in December 2009, when it was revealed that Hatoyama had received some ¥1.2 billion in political donations that had been improperly reported. Most of the money came from his mother, the wealthy heiress to the Bridgestone empire, though ¥400 million of this was listed as coming from fictitious donors — including some who were deceased. Prosecutors declined to bring charges against Hatoyama, citing insufficient evidence of criminal activity. They did, however, indict two of his former secretaries, resulting in a ¥300,000 fine for one and a suspended sentence for the other. While no question of corporate bribery or political favors was involved, the incident nevertheless served to raise questions in the public’s mind about just how different the DPJ was from the money-tainted politics of the long-ruling LDP. The media was unforgiving. After all, Hatoyama had already managed to upset both the establishment media and their new-media competitors. The former fought against his proposal to open up the prime minister’s news conferences to journalists from outside the cozy “press club,” and the latter were angry after he failed to follow through on that pledge. One club-affiliated reporter told Hatoyama that the prime minister’s press conferences were not something he was in charge of but, rather, something the press club sponsored. Although by March 11, 2011, Naoto Kan was prime minister, Hatoyama was still a member of the House of Representatives, and the multiple disasters — especially the nuclear meltdowns at Fukushima No. 1 plant — affected him deeply. In the December 2011 issue of the magazine Nature, Hatoyama co-authored an article expressing his concerns about both the radioactive and political fallout from the accident. Hatoyama’s change of mind is significant because as prime minister in October 2009 he had given a speech in Copenhagen in support of Tokyo’s failed bid for the 2016 Games. At the time, he sought to promote a new image of the Olympics centered on environmental protection, held in harmony with nature and celebrating simplicity. Hatoyama’s reservations about Japan’s future are not limited to either Fukushima or the Olympics. Politically and militarily, Hatoyama believes Japan is moving in an ever more dangerous direction. While in Nanjing, Hatoyama also urged the Japanese government to acknowledge the dispute between the two countries concerning sovereignty of the islands known the Senkakus in Japanese and Diaoyu in China. “The Japanese government says there are no territorial disputes, but if you look at history, there is a dispute,” he says. In August 2015, just prior to Prime Minister Abe’s statement commemorating the 70th anniversary of the end of World War II, Hatoyama visited the Seodaemun Prison History Hall in Seoul. 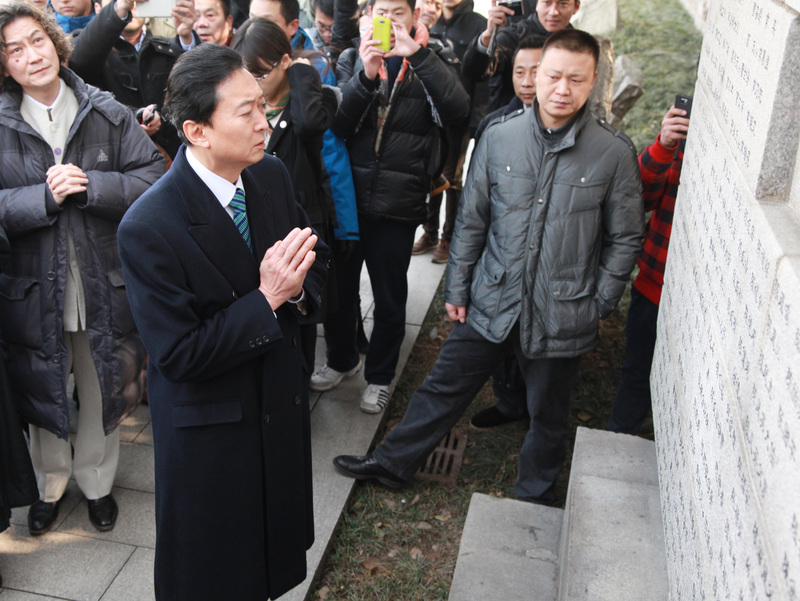 He knelt down in front of a memorial stone to apologize to Korean independence activists jailed, tortured and executed during Japan’s colonial control of Korea from 1910 to 1945. “In the hope that no such mistake is made in the future, I regard, in a spirit of humility, these irrefutable facts of history, and express here once again my feelings of deep remorse and state my heartfelt apology,” he said. While not turning his back on the West, Hatoyama nevertheless seeks to redirect Japan’s focus away from the U.S. and back to its geographical location in Asia. He imagines a Japan at peace with its neighbors — from Russia in the north to China and South Korea — and at ease with its position on the edge of the continent. With this dream in mind, Hatoyama created the East Asian Community Research Institute in March 2013, with the ultimate goal of creating something resembling an East Asian EU. With membership open to the general public, the institute, through its educational arm, Sekai Yuai Forum, holds lectures and other events to promote Hatoyama’s vision. All of which brings us back to the issue of the U.S. military presence on Okinawa. Hatoyama continues to be concerned about the struggle of the Okinawan people against the construction of the new U.S. base at Henoko. This led to a series of trips to Okinawa seeking a solution to this intractable problem. 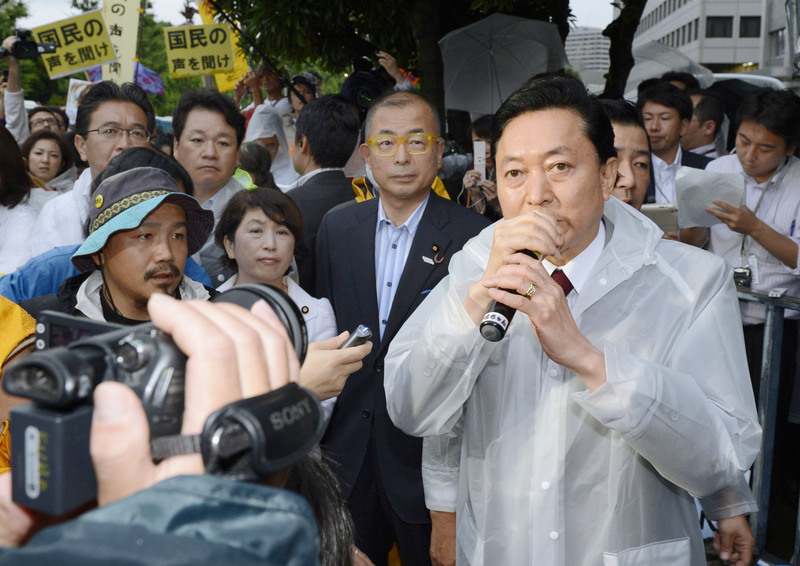 As recently as November, Hatoyama visited the island to encourage the anti-base demonstrators at Henoko. Hatoyama envisions a future for Okinawa not as a “keystone of the Pacific” for the U.S. military but as a “keystone of peace” for the countries of Asia. He has called for the creation of an “East Asian Community” headquartered in Okinawa and composed of the 10 members of the Association of Southeast Asian Nations plus Japan, China and South Korea.